GitHub was the first true social coding site, and Juri Strumpflohner will introduce you to basic etiquette and requirements, including knowledge of Git and PRs. GitHub revolutionised the open source world by building - IMHO - the first true social coding site. It has never been that easy to contribute to a project, whether it is to simply discuss some new features, to file a bug or in the best case to submit a bug fix or new feature patch: a pull request (PR). Still, I found lots of devs don’t know how to properly create a PR, yet. With this article I hope to lower that entry barrier. Git is the most widely used version control system, especially for Open Source projects. While you could use SVN on GitHub as well, most projects don’t. Simply because Git is much more suitable for the use case of distributed working, where multiple people from around the world clone, fork and submit new changes to your repository. I highly recommend you to take the time and study these, get used to them, play with some local demo repository where you try them out (without breaking anything). Trust me, this will save you a lot of trouble and pain. Every serious dev needs one. No, really! Go to https://github.com, create one and link it to your local Git shell. Ok, I have something to contribute. How should I proceed? Search whether someone else already proposed it or already submitted a fix. GitHub has a simple, yet excellent issue tracking system. If it is a bug, create a failing test, try to reproduce it locally. Good repos already have a good test harness in place. Then submit your fix as a PR (including a test that verifies it’s absence). If it is a new feature proposal, I personally recommend to get in touch with the author(s). Create an issue and propose your enhancement and new feature. In that way you gain additional insights from the author or core contributors and especially you avoid to go in a wrong direction. Submitting new code that doesn’t get merged because the author thought about it differently, hurts. Believe me . Definitely check the README.md, which is automatically rendered in a nice readable way at the root of the GitHub repo. Many repos include instructions for building the repository and especially guidelines for contributing, building etc! 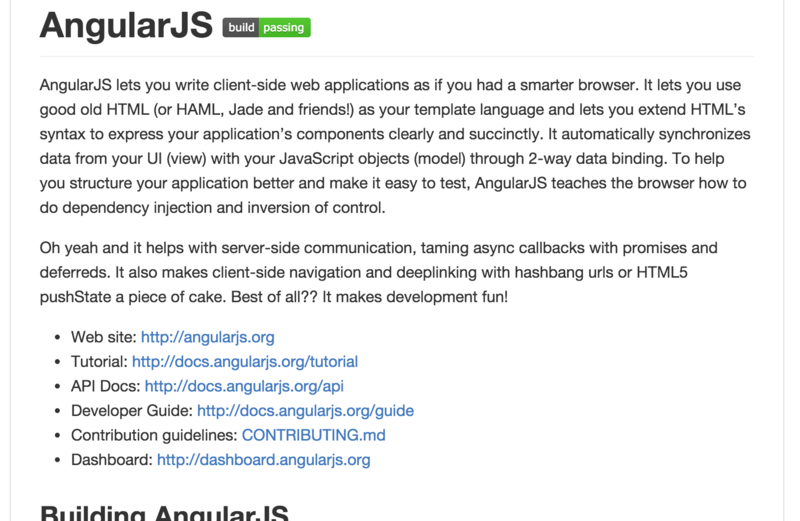 commit messages guidelines (for example: angular.js, atom.io ). Ok, ready to get started! Now it’s time to pack out your Git Jedi tricks. This will automatically create a copy of the repository under your own GitHub user profile. Now that you have a copy within your own GitHub user profile, you have full read/write access and you’re ready to apply your change/feature implementation to the codebase. Clone your fork and start coding. If you don’t wanna dive into it right now, at least create a feature branch for your change. This is highly recommended. Now it’s time to code: implement your changes. Usually when you develop, you may have lots of commits, even intermediate ones, with commit messages that probably only you understand (if even.. ). Use git rebase to polish your history and only include those that are relevant and help the author to more easily review your changes. Here’s how to do it: Polish your feature branch commits. Once you pushed your branch to your repo, simply open it on GitHub. A prominently highlighted message should appear, inviting you to create a PR. Click the "Compare & pull request" button and fill out the details. Wohooo, you did it! Your PR is done! GitHub also has an excellent guide on how to do it. Btw, you can simply push additional commits to your forked repo’s feature branch and they’ll automatically appear on your PR. If your contribution was a one-time bugfix, you can also delete the repo once it is merged. Instead, if you intend to contribute further changes, you might want to setup a link to the original repository s.t. you can update your own repo’s master from now and then. Or with a git fetch followed by a git merge (based on your prefs). Here’s the GitHub Help page article that might also help.